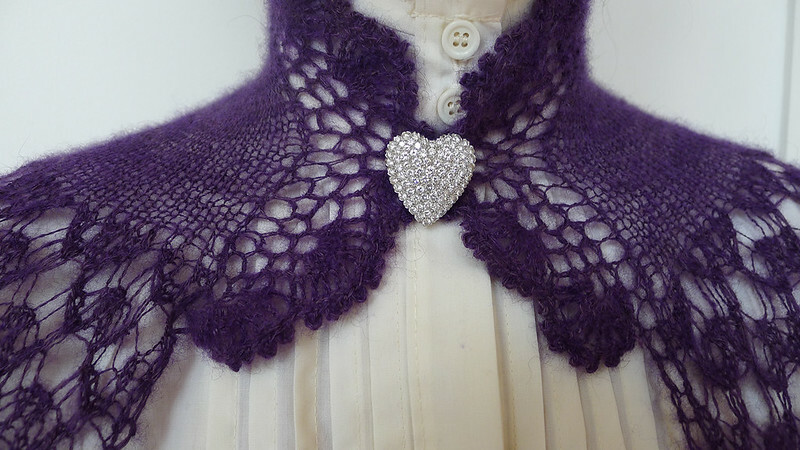 I hope you'll post a pic of your embellished Nouveau Beaded Capelet when you finish it. I still haven't started mine... other projects keep getting in the way... but a collar sounds like a nice addition. Shame on that vendor for ruining qiviut! 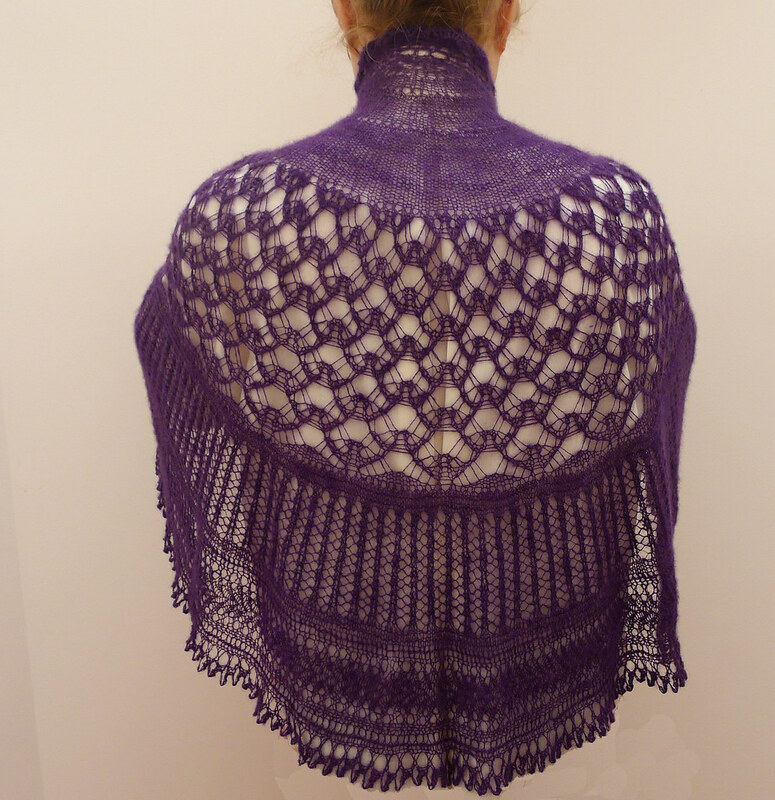 Lovely shawl, can't decide which is more impressive, knitting and adapting the shawl or spinning the fiber. kudos! Unusual design, and a very interesting collar addition. But I would like almost anything that is that color - so rich! 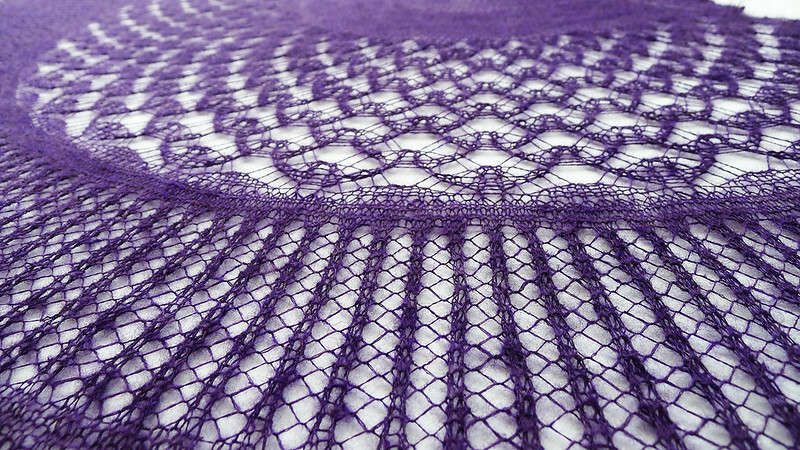 That is a beautiful shawl, it might have to go in my ravelry queue! I've never used qiviut before, is there anything else it is comparible to? Wow. That is GORGEOUS. I love the color, and the neckline! Truly stunning.. I love the edge you added. Hope you are doing well. I'd love to know how you did the collar! Very clever addition with the collar. Did the crochet give you more structure to make the collar stand up? Simply stunning. Love the collar. And the colour. It looks perfect on. I'd be interested to have a bit more insight into how you made the collar. 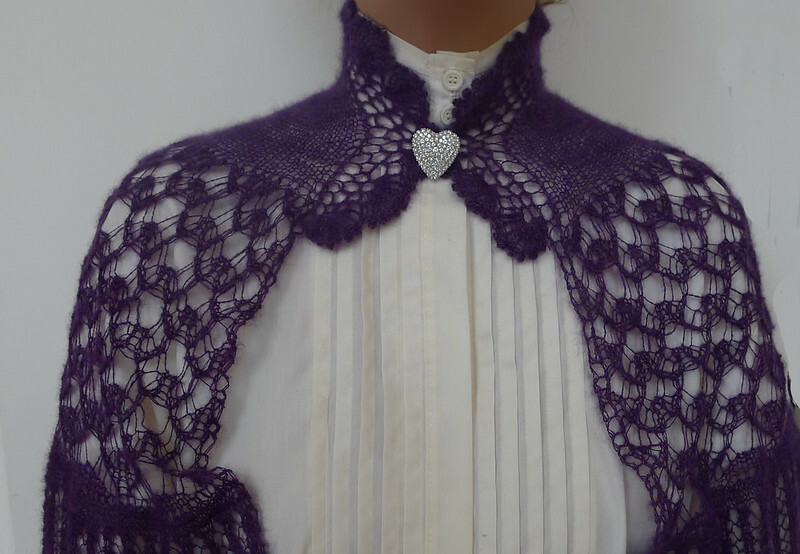 I am pondering adding a ribbon backing for the nouveau beaded capelet, because, yup, it looks a bit odd as is, and kind of flimsy. I added a clasp, but still not satisfied. The added collar clearly adds shape when you wear it. 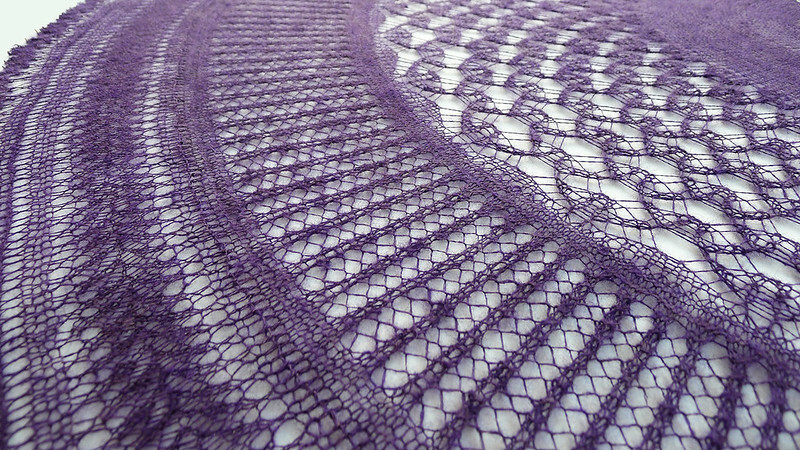 I'm still stunned by the fact how big the difference is between the main pattern (vèry open) and the fagotting (pretty close together). 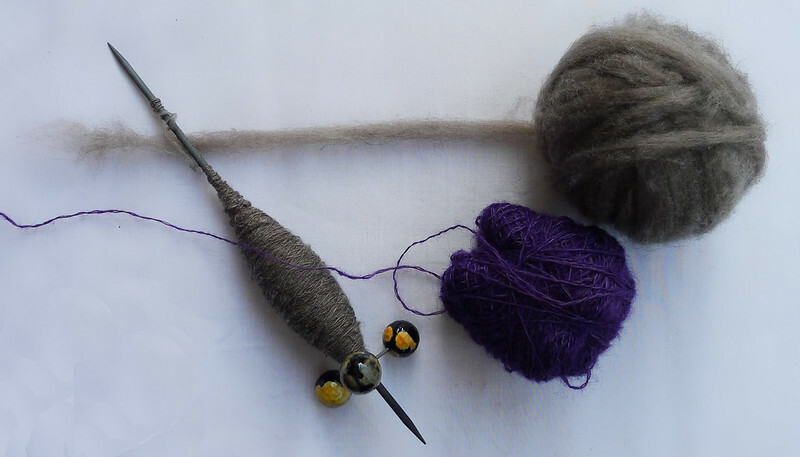 I also have some (already spun) quiviut in my stash, and even mixed with angora, it hasn't tempted me to knit something up with it. That is beautiful. 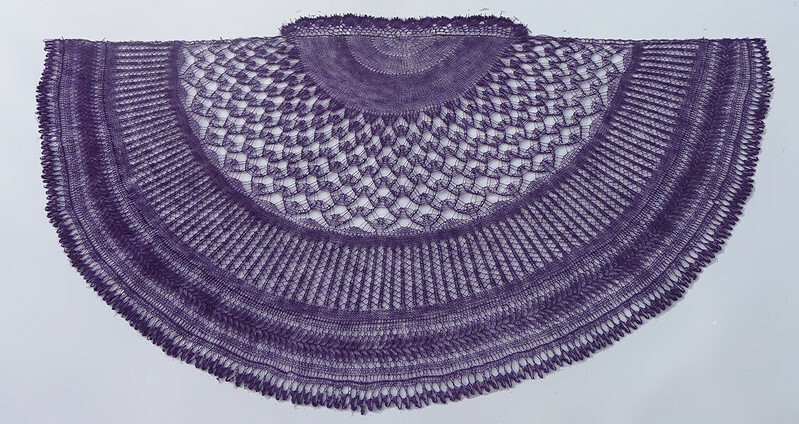 I think though, that the main pattern should have gone where the fagotting is; if you are wearing a shawl for warmth, as I do, then the most dense areas are better being closest to the shoulders. And it would make an equally interesting gradation between the densities of the patterns - densest at the neck, gosammer at the hem - if the two were switched up. 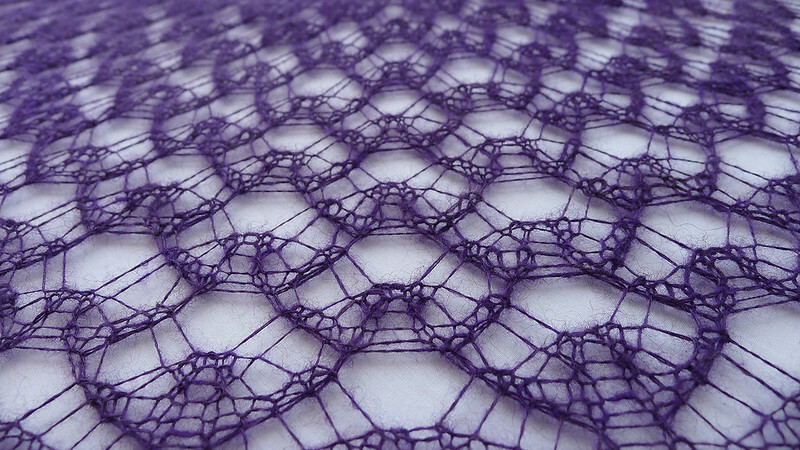 That being said, I've done edgings in 'true lace' and I don't think I would ever attempt something like this. 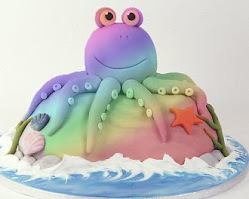 It is absolutely lovely! You know, when I saw that in the Saturday class at SAFF, I was thinking it looked like Vostok. It really is softer than it looks, and I love the collar you added.